Cookees Drive-In Classic Burgers Fries Ice Cream And More! 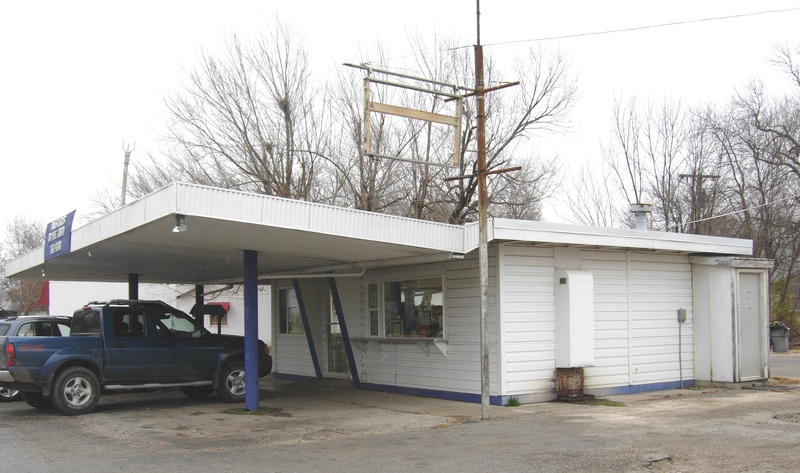 Voted BEST in Linn County for 4 years in a row for Hamburgers, Shakes/Malts! 2009, 2010, 2011,2012!! Discussion Forums. Come In and Chat! Hours: Mon-Thurs 11am-7:00pm Fri-Sat 11am-8pm Sun: 11am-6pm. 8 years in a row! 2009-2016 Thank you Linn County! A great look at Cookees When We Purchased It VS. What It Looks Like Now! We are quickly approaching our Car Show! Download the PDF by clicking on the picture and get your early entry in! have a Christmas of usable items, not loneliness. 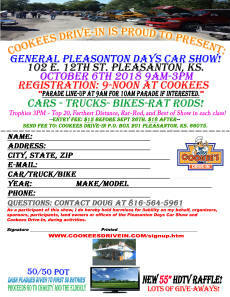 *Cookees Receives Civic Leadership Award From The City Of Pleasanton Read HERE! 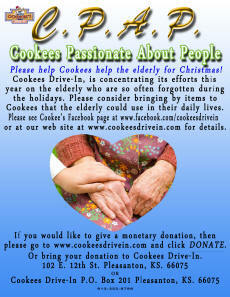 *Cookees Exceeds Goal with $461 - Cop On Top For Christmas Express! Read HERE! *Cookees has donated over $500 To The Linn Co. Children's Coalition Charity! *Cookees donates $200 to Pleasanton High Ball Association for Spring 2010! *Cookees donates more ice-cream cones to Children's Mercy Clinic! Over $300 so far! *Cookees donates $315 to Pleasanton High School from it's Haunted House proceeds! *Added a news article on our donation to the Mercy Clinic to help the children HERE! *We made our own amateur commercial! Just for fun, Check it out HERE! *How crazy is dollar night? Click HERE to see our grill stacked high with orders!! 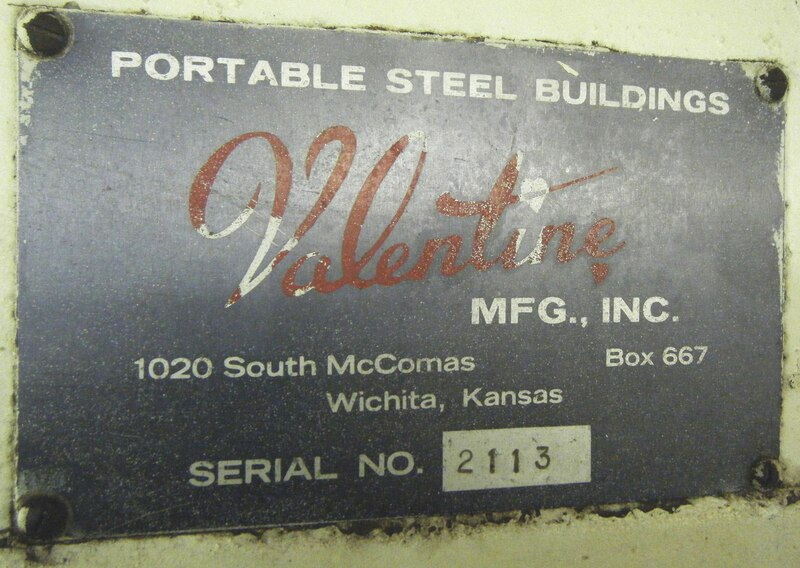 According to the Kansas Historical Society, we have a historic Valentine Diner Building! Below is a picture of our S/N plaque! Click here for history and pictures of these buildings!